Mexico has a new president – Andres Manuel Lopez Obrador declared victory. Let’s see how cooperation with Trump will benefit to a stock market. 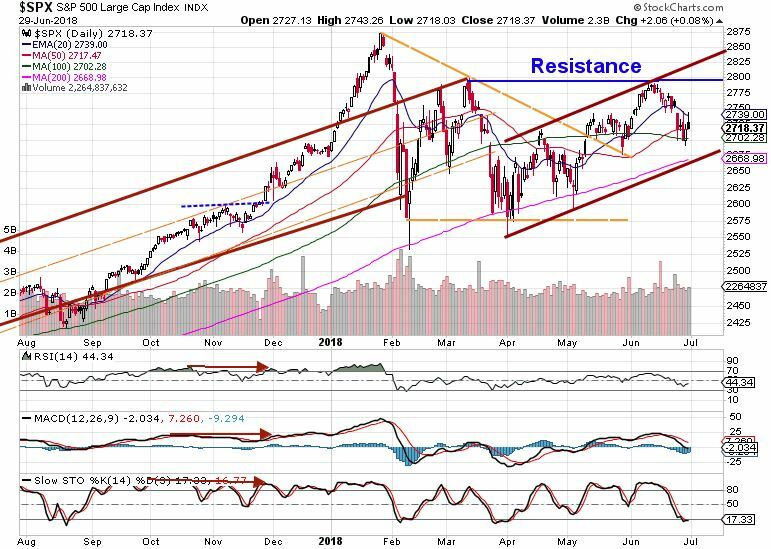 Until this revolves in several months, let’s see much more important evidence of current stock market situation – Trend Analyses of Market Review #26! 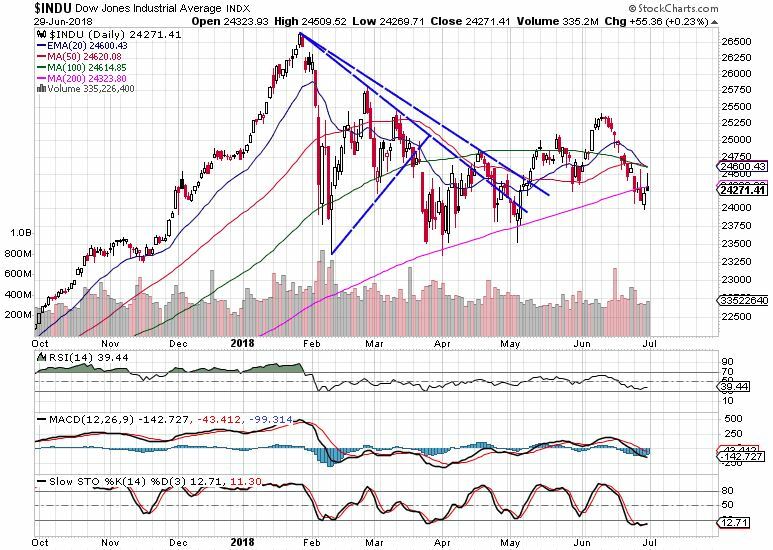 The stock market has declined last week crashing the short-term supports and making investors thinking about an end of the bull market. Well, every market has its cycle that represents 4 different levels: Consolidation, Expansion, Peak, Contraction; The current stock market has been running in Expansion for a while and thus, one might think OK, maybe it’s enough. Increases in the interest rates and super-low unemployment with a risk of out-of-control inflation are signs that money will flow out of equities and thus, we might be experiencing stock market cycle‘s level 3 – Peak. Even though the rates are increasing, they are coming up from ground levels, thus it will take some time for them to reach levels that bring a reasonable return. Until then the stocks have space to grow more – up to the Peak level. February correction ended a two-year-old bull trend channel. 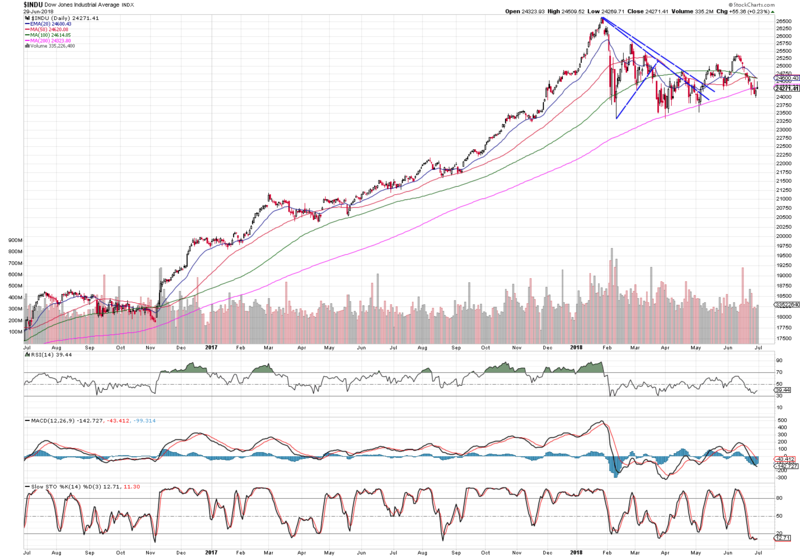 The following consolidation in form of descending triangle has completed and the index may finally reveal its new trend channel. It is depicted by brownish wide lines. In short-term: the volatility increased last week pushing the price down. It may continue declining to hit 200 MA this week. Dow Jones broke below 200 MA. 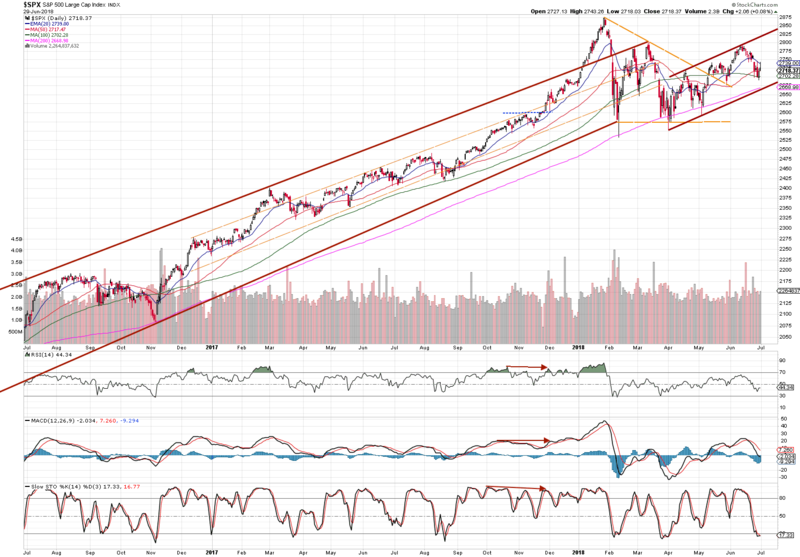 It will likely try to slide 200 MA until an overall market will help to lift it up again. 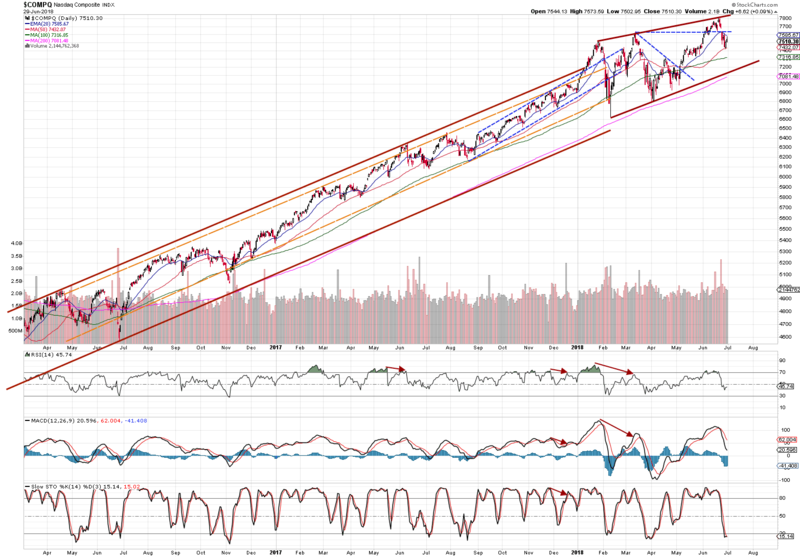 Nasdaq has a similar story as S&P when its very long trend channel ended in February. We are trying to follow a new one in long-term. 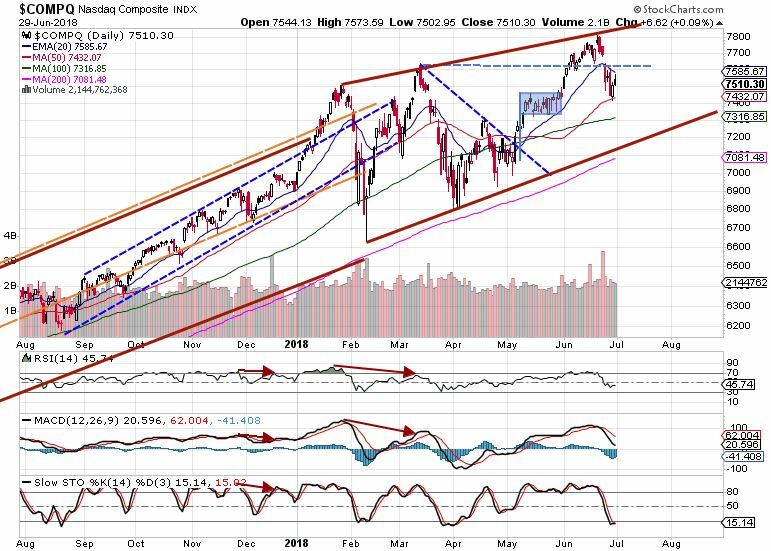 In short-term: the price broke its support (horizontal blue dashed line) which was immediately a sign of further decline. It is likely to go down in upcoming days/weeks even to test 100 MA. The 20 EMA will serve as the short-term resistance level. The FTSE100 is consolidating modestly downwards after it reached highest high previously. See the trend lines below for the nearest possible support level. The stock markets are drawing an upward trend in long-term, however, we are currently seeing a short-term fluctuation to test support levels. Until the short-term resistance levels are broken, a wise trader would not take any long position at the moment.